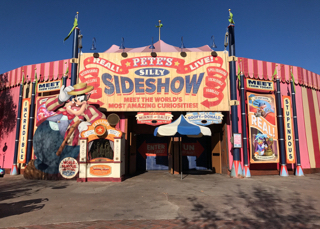 Pete's Silly Sideshow can be found in Storybook Circus. Because of its location, this is an often overlooked meet-and-greet spot, where guests can meet 4 of the quintessential Disney characters. Goofy, Donald, Daisy, and Minnie are all in their "circus" attire. If you visit this spot early in the day, you can usually meet all of them with minimal waiting. I always love pointing out "Hidden Mickeys" to my tour guests. I call this one a double, since you have the larger one created by the marker and rocks, and the smaller one engraved in the metal. It is located in the Little Mermaid area of Fantasyland. My favorite area of Animal Kingdom is Gorilla Falls. A few days ago, they were all very active while I was bringing a tour group thru the area. 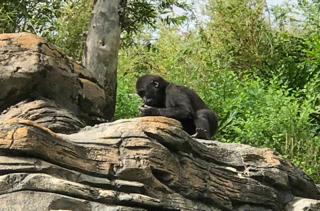 This "baby" gorilla was enjoying a snack, high atop these rocks. The T-Rex Cafe is a popular spot located at Disney Springs. It is part of "Landrys," which also owns Rainforest Cafe and Yak & Yeti. We ate in the Ice Cave room of the restaurant tonight, where I took this picture. It is always fun to see how the entrance area of Epcot will be decorated. There are many festivals and holidays, where you will see different flowers, characters, and signs. 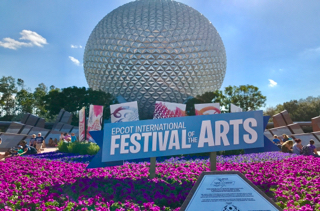 This month, Epcot is featuring the brand new Festival of the Arts. 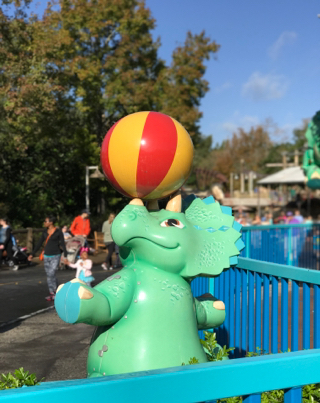 TriceraTop Spin is one of the few rides for young kids at Animal Kingdom. It is part of the "carnival" area in Dinoland, USA. 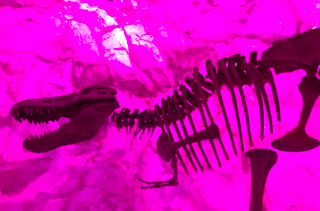 I took this dino shot a few days ago, while giving a tour. 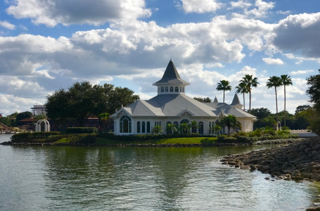 Disney's Wedding Pavilion is located at The Grand Floridian Resort. It is the most popular spot at Walt Disney World to get married. However, there are many locations on property where weddings take place. The last number I heard was that there is an average of 6 weddings per day at Walt Disney World. Harambe is the African village found in Animal Kingdom. 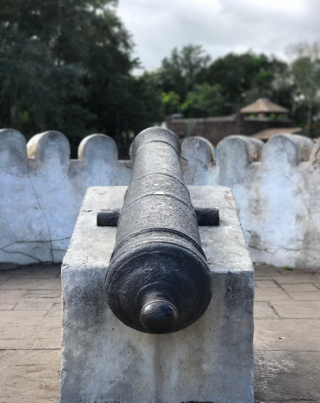 This canon can be found on the walkway to the Festival of the Lion King theater. I took this shot yesterday, while my tour guests were enjoying lunch at the nearby Tusker House restaurant. 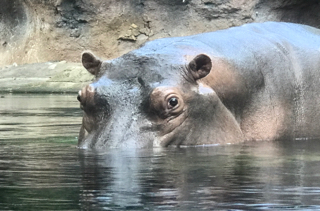 Normally, being this close to a Hippo would be very dangerous for a human. 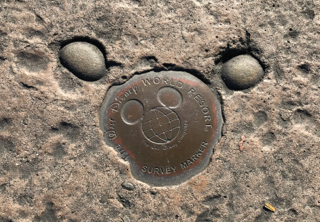 However, a closeup view is possible at Animal Kingdom. I took this shot while guiding my tour guests through Gorilla Falls today. The glass was so clean, that there didn't appear to be anything between me and this powerful beast. Here is another shot from my visit to the Grand Floridian Resort from a few days ago. 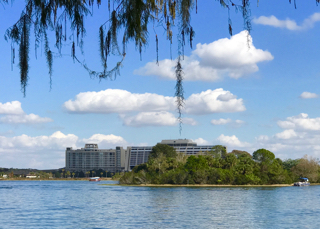 There is a great view of Bay Lake Tower and much of The Contemporary, from the shore near the Boca Chica building. I like how the tree branches and leaves helped to act as an upper "frame" for this photo. Animal Kingdom is the obvious spot for the Jungle Book characters. The success of the 2016 live action film has made these characters even more popular. I took this shot of King Louie on a bridge to "Asia" last week. The Polynesian Village Resort is one of the original hotels (along with The Contemporary) at Walt Disney World. They recently added the "bungalows" as part of a DVC expansion. I took this shot yesterday, from the shore of The Grand Floridian Resort. 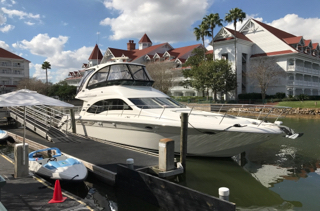 The Grand 1 Yacht is a large vessel that can be rented by guests to enjoy time on the Seven Seas Lagoon and Bay Lake. It is a 52 foot long "Sea Ray" Yacht that can hold up to 13 people. It is based at the Grand Floridian Resort, which is where I snapped this shot today. Timothy Q. Mouse is one of the stars of the classic 1941 film, Dumbo. 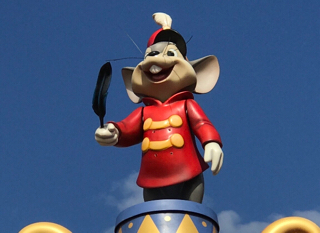 He can be found in the Storybook Circus area, sitting atop the Dumbo entrance. I took this shot on Monday, while giving a Magic Kingdom tour. 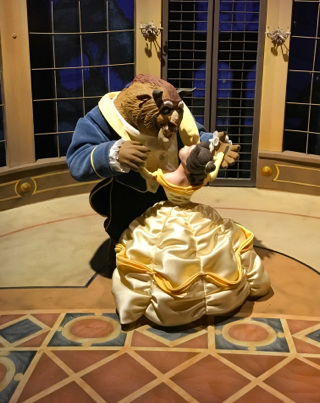 Beauty and the Beast is such a popular movie, that it's characters are present in three of the four Walt Disney World parks. This is actually a small display in a window of the Emporium, on Main Street in the Magic Kingdom. I took this shot while visiting the park with my family last week. 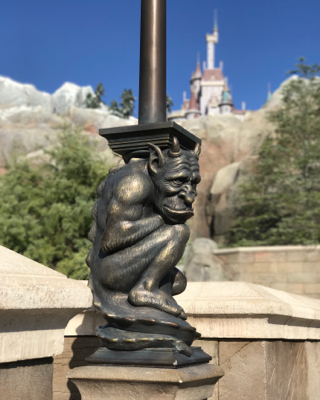 It is hard to believe that the Be Our Guest restaurant has been open for more than 4 years. This spot seems as popular as ever, and it is still difficult to get reservations. I took this shot of one of the statues on the bridge today. Buzz Lightyear's Space Ranger Spin is a popular attraction in Tomorrowland. It is always fun to try to achieve the max score of 999,999. 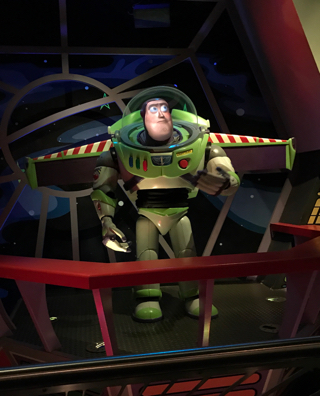 I took this shot of the Buzz figure in the queue, while riding with a young tour guest today. When walking around Tom Sawyer Island this week, I noticed this interesting view. 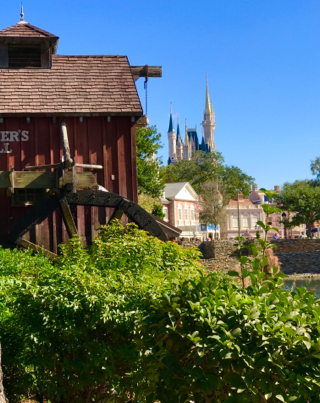 I liked how Cinderella Castle lined up behind Harpers Mill. After looking closer, I realized I captured three different lands in this shot, with Hall of Presidents visible as well. 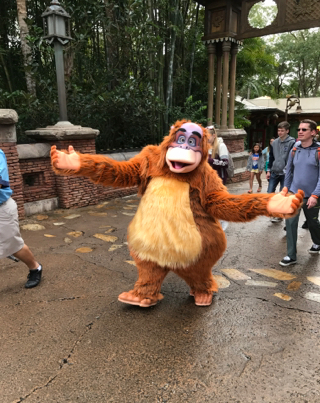 There some unique animals at Animal Kingdom that many guests don't often see. 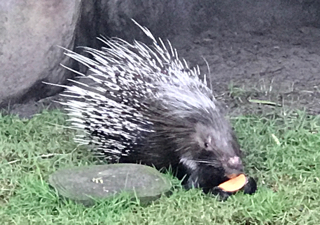 The porcupines, found near an exit path from "it's tough to be a bug," are usually asleep near the back of their enclosure. Today, I saw this guy awake for the first time in many years. 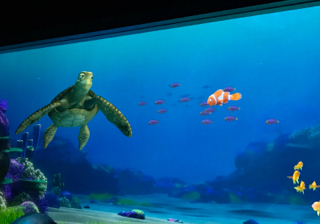 Turtle Talk with Crush has been entertaining guests at Epcot for years. It is a simple, interactive show utilizing some great technology. I took this shot today, while enjoying Turtle Talk with my tour guests. Art of Animation has several well themed pools. This one is in the Cars area, and features the "cozy cones." 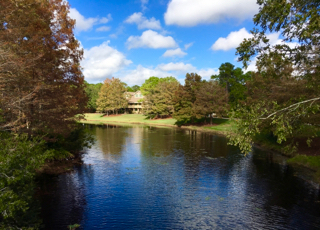 I took this panorama shot a few weeks ago, while walking around the resort. Yesterday, I spent some time on Tom Sawyer Island. While sitting at "Aunt Polly's," I noticed that I had the best possible view of my favorite attraction. 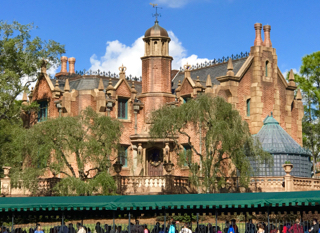 You can really see Haunted Mansion details from this angle that you can't see well in the queue, such as the black wreath on the front door. 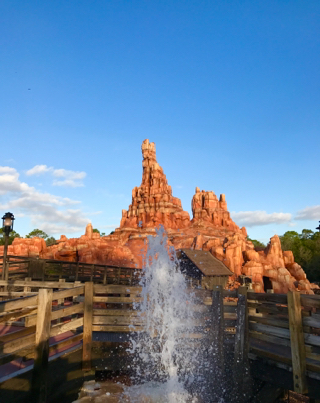 Many of my guided tours start with a ride on Big Thunder Mountain Railroad. Visiting this spot early in the morning provides for some nice photos. Also, the winds are typically light during that time of day, so water from the geyser doesn't spray guests that are walking by. Port Orleans - Riverside is a large resort, with numerous pathways and a river that runs right through it. There is a lot of natural beauty to be found here. There are several bridges that provide a good vantage point to take photos like this one. My favorite float in the Festival of Fantasy parade at Magic Kingdom has to be Maleficent as a dragon. It is one of the more elaborate parade floats in Disney history. 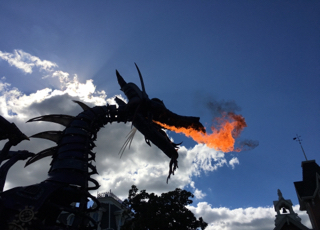 Although I've taken many photos of it, I like how this "breathing fire" shot looks against the background of the blue sky. 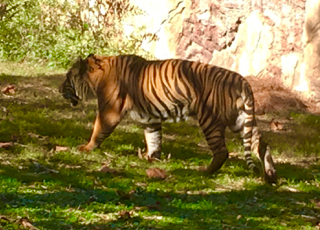 The Maharajah Jungle Trek is home to two Sumatran tigers. They are on the critically endangered species list, with only about 500 left in the world. There is one female and one male here, and Disney hopes to breed them in the near future. I took this shot of the male Sumatran a few weeks ago. 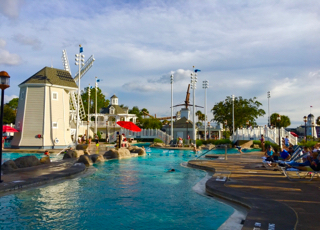 Stormalong Bay is an impressive pool complex located at Disney's Yacht and Beach Club resorts. At over 3 acres, it is more of a water park than a pool. It contains nearly 800,000 gallons of water and features a lazy river, as well as a 230 foot long water slide. I was standing in the area outside of Star Tours tonight, waiting for our son to participate in the Jedi Training Academy. 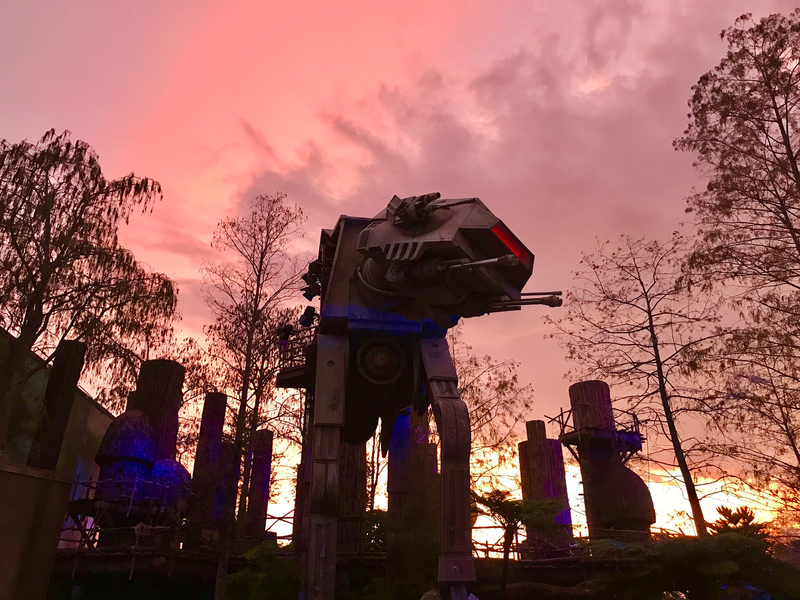 I liked the way the way the sun was setting behind the Ewok village, as it made for a nice photo opportunity. Also, you can never have too many pictures of an AT-AT! 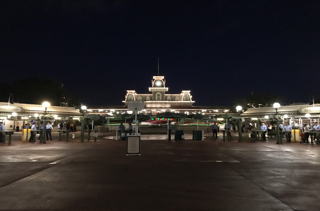 At first glance, this appears to be a normal nighttime shot of the Magic Kingdom entrance. However, if you look closely you will see security guards manning the bag check stations, and very few guests nearby. In fact, this isn't a nighttime photo at all, but actually a pre-dawn shot. 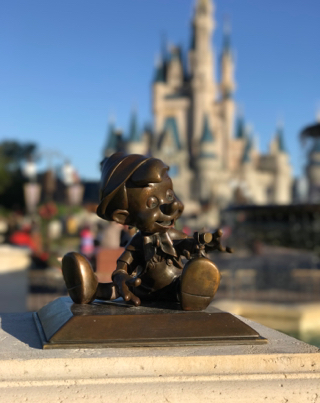 During the weeks around Christmas, the park opens at 7:00 am. Guests start arriving around 6:30, which is about the time I snapped this picture. Since it is the first day of the year, I thought it would be appropriate to post a photo from the first Walt Disney World park. 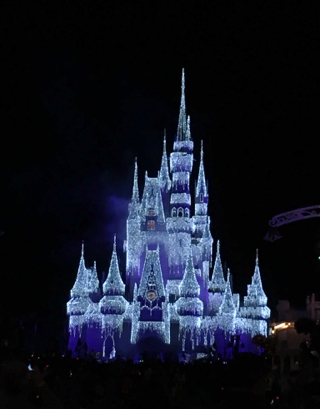 Cinderella Castle has been an American icon for 45 years, and it looks even more spectacular during the Christmas season. On a side note, today is the 6th anniversary of Digital Disney World, and I want to say a huge thank you to all of you who continue to visit the website! We come to the end of the Christmas season, and I saved one of Disney's best displays for last. 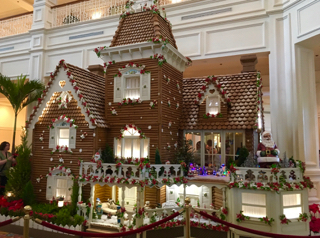 The Grand Floridian gingerbread house has become an "attraction" unto itself. This amazing creation seems to get better each and every year.